The Korg LP-180 is an attractive piano with a bevy of features that make it perfect for a range of players. A stylish build that includes a piano stand with a top down cover, which is quite impressive as not many manufacturers include this, the LP-180 is a fine addition to any home. Measuring approx. 53 x 10” x 30”, the LP-180 should fit into most spaces with ease, and at just over 23kg it is easy enough to move around. Of course, looks only get you so far, but the LP-180 is certainly a great sounding digital piano worth investing in. Perhaps the best sound of the piano comes from it’s acoustic piano sounds. This makes sense, as the LP-180 aims to replicate that classic acoustic sound and feeling, which it does to great effect. There is a total of ten voices to choose from too, so players have enough variety to create diverse pieces. The most impressive of these are undoubtedly the two acoustic piano offerings, which really do sound like a grand piano, producing a classic sound that is hard to come by in many digital pianos. One of these sounds is more akin to the classic grand piano, while the other has a slight brightness to the sound. Both a great in any case, especially when used with chorus and reverb effects to really recreate that live concert sound. The other sounds are quite typical of most digital pianos, including two electric pianos, two organs, a vibraphone, clavichord, and strings. Sadly, no accompaniments are included with the LP-180, so you’re somewhat limited in that there are no background rhythms to play along with. The LP-180 doesn’t just faithfully replicate that classic acoustic piano sound, but also the touch and feel. It features 88-keys, making it great for playing classical music, while the keys also feature natural weighted hammer action. This is certainly one of Korg’s best hammer actions and feels much the same as any most others on the market. Basically, the keys are weighted to feel like an acoustic piano as you press down on them. For instance, the lower ranges require a heavier touch, with the keys becoming progressively lighter the higher the register you go. It feels fantastic, and even comes with three levels of key touch control, allowing players to adjust the response to suit various playing styles. The light touch provides a pianissimo feel, the normal touch offers a feel akin to classic pianos, while the heavy touch response is an advanced feel suitable for the most experienced players. Another great feature that highlights how classical a feel the LP-180 enjoys is the three-pedal unit. Included with the digital piano, the pedals are vital for producing an authentic acoustic piano sound, including a damper, soft, and sostenuto pedal. Both the damper and soft pedals come with half-pedal functioning, meaning players can create a more nuance to their performance, which is necessary for practicing those more difficult classical piano pieces. 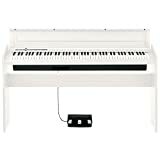 The pedal is also removable from the unit, so can be taken on the go with the LP-180, making the piano a great option for taking to practice as well as playing at home. Another handy feature rounds out the already impressive LP-180. For example, a dual stereo jack allows two headphones to be used simultaneously – perfect for quiet lessons with students or for dual playing with a friend. All in all, the Korg LP-180 is an excellent digital piano. It produces wonderful sounds that are very close to an acoustic piano, while the weighed hammer action keys make it feel just as real. A selection of sounds may be lacking for some, there is no denying the LP-180 offers great value for money.